Cuautitlán Izcalli, Mexico State. During the re-inauguration of the Ford Factory in Cuautitlán, President Felipe Calderón declared that Mexico is at the cutting-edge of the world automobile industry. 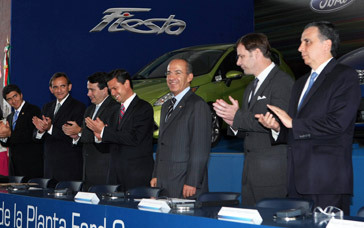 Accompanied by Governor of the State of Mexico, Enrique Peña Nieto, during the launching of the Ford Fiesta 2011, the President declared that the economy is already recovering from the economic crisis, as borne out by the 382,000 new jobs registered during the first four months of the year, the highest figure in the country’s history. However, he stressed that although this is good news, efforts must be redoubled to promote the Mexican economy. “Our main challenge, as my government sees it, is for this growth and recovery to be felt in people’s pockets. And we know that one way to do this is to turn Mexico into a country that will attract and encourage investment and create jobs by ensuring that national and global, public or private investment will allow us to speed up the rate of growth,” he said. The President declared that of the three billion pesos Ford is investing in Mexico, one billion were assigned to the Cuautitlán plant to renew the installations. It now has a new die casting area of over 25,000 square meters and a line of five, high productivity presses with 270 robots, making this one of the most flexible and advanced manufacturing complexes not only in this region, but worldwide. He indicated that the production volume of the new Fiesta 2011 is estimated to reach 180,000 units a year in the beginning and eventually total 300,000 a year once the factory operates at full capacity. President Calderón reported that Ford Cuautitlan has created 2,300 direct and approximately 8,000 indirect jobs. “All of this shows that Mexico is an ideal place for manufacturing in general. Various indicators not only rank Mexico above Brazil, China and India and other countries it competes with as regards competitive costs and intellectual property but also rank it extremely highly in the world automobile industry, thanks to the advantages it offers,” he explained.